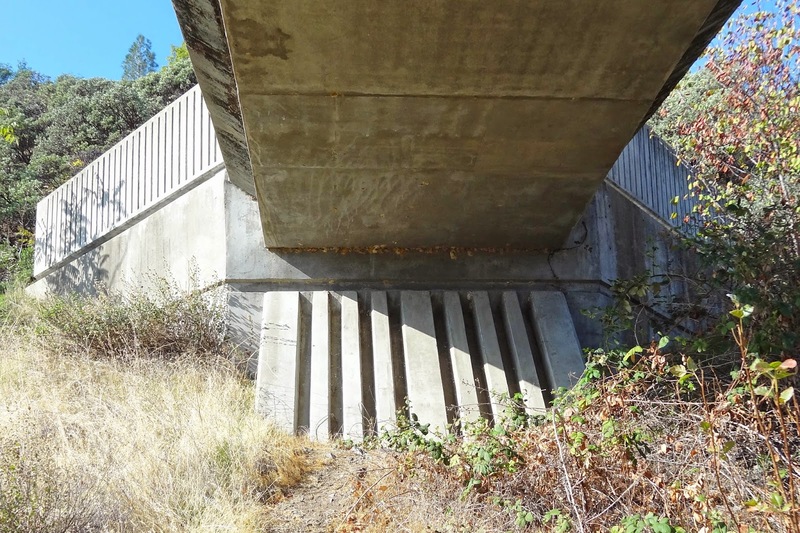 Rather than the typical seat-type abutments found on most bridges, the Sacramento River Trail Bridge abutments helps carry the large tension force of the hanging bridge superstructure into the earth. The superstructure deepens as it approaches the abutments to separate the cables before they are anchored into the bedrock. The superstructure is composed of waffle slab segments with tapered edge elements carrying the barrier rail. I wonder if the cables are distributed across the deck or are concentrated along the sides? Shasta County, California Bridges: Sacramento River Trail Bridge (3) by Mark Yashinsky is licensed under a Creative Commons Attribution-NonCommercial-NoDerivatives 4.0 International License.